Three random games. From mainframes up till the 5th Generation. Lots of fun/misery. 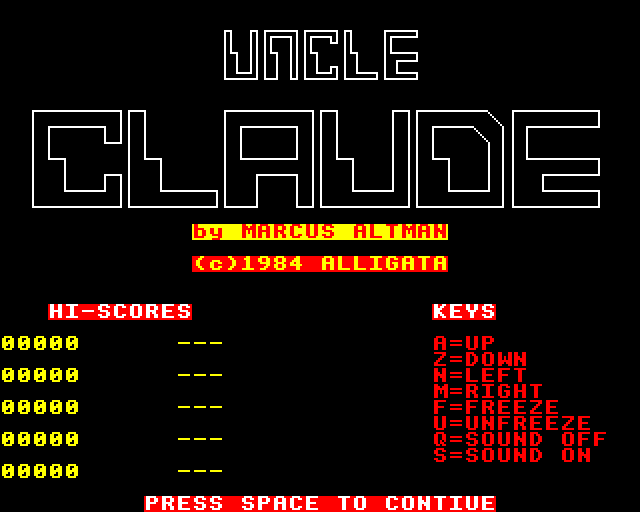 First up in the new RND draw is Uncle Claude - a madcap swing at the competition from the BBC Micro camp. 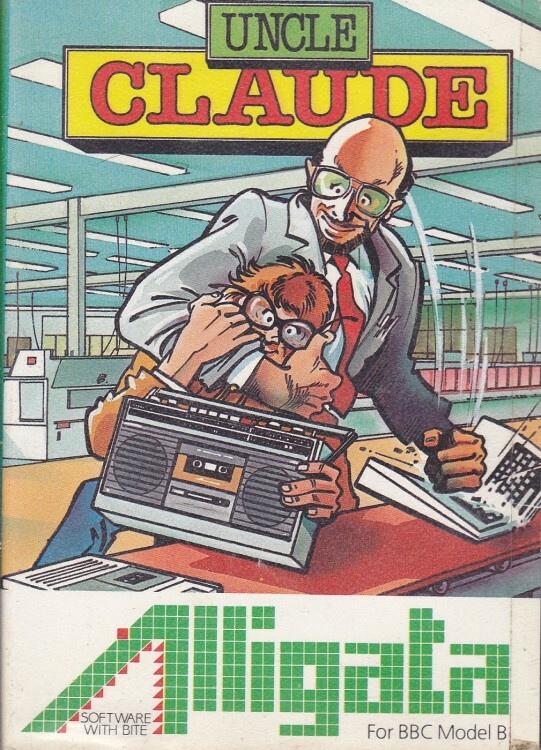 Yes, the titular Uncle in reality is named Clive not Claude - Clive Sinclair that is (already a "Sir", too) In the early eighties, BBC and Sinclair Research were embroiled chip-deep in a fierce battle to provide microcomputers for UK schools - a government subsidized scheme, won eventually by BBC/Acorn. This game seems to be the "final laugh" for the BBC - in 1984 Sir Clive was launching his ill-fated Sinclair QL and since then his fortunes were on the wane. Here he`s portrayed as a demonic bully - check the game`s cover, where he smashes a Micro with one hand and keeps some poor kid in a headlock with another. Strong stuff! That`s one for the fanboys - if you think rivalries at the dawn of computing/videogaming were any less fierce than nowadays (maybe bit more classy though), think again. The game itself is a classic action collect`em & avoid`em up from that era - as the Headlock Boy you need to run around a single-screen stage and push assorted - presumably Micro - elements scattered around down onto a conveyor belt. Uncle C gives chase, utilizing a supply of his creations as thrown weaponry. Clear the items and a key to the next stage appears, with more varied and difficult layouts and much faster Uncle. Usual bonus/trap objects make appearance occasionally, lying or flying around. The "pushing" is what makes the game interesting - as is usually the case with environment interaction. You can place the parts on the conveyor to clear the stage but also use them to knock Uncle out (when pushed at him from above or beneath). This makes the stages quite dynamic and more complex than in a "fixed" action game. Despite cruel (for the Manor residents at least) anti-Sinclair bias,we must admit that Uncle Claude is a pretty good game - a solid action title with an interesting gameplay angle. Smooth controls, cheeky premise and decent gfx add to the fun - recommended! 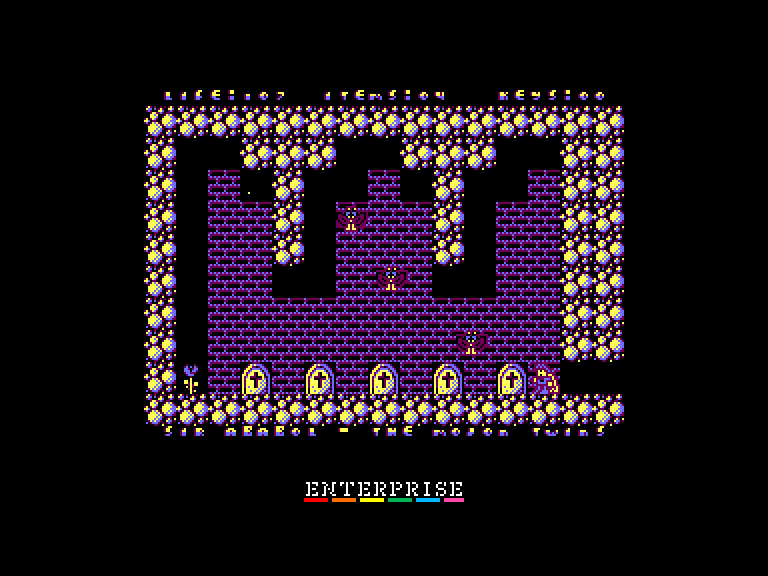 Not far from BBC Micro, we`re entering the Z80 zone for our next game - this time it`s Sir Ababol for Enterprise...but, there`s a twist. 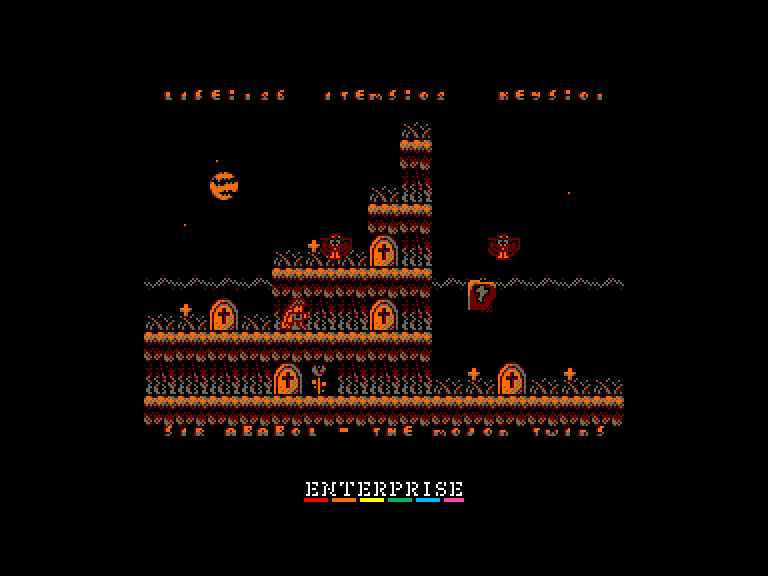 This is not a retro blast, but a new(ish) production from a team called The Mojon Twins - extremely prolific coders operating mainly within the current 8-bit scene. Their game catalogue lists over 50 releases for various retro platforms, a rather impressive tally. Especially given that it contains titles as varied as Jet Paco and Ultimate First Communion Simulator. 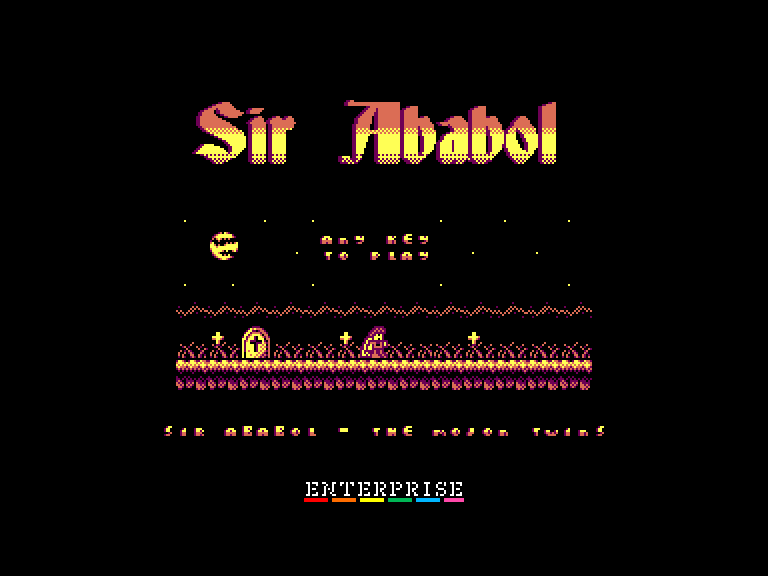 Sir Ababol was originally written for ZX Spectrum in 2010 and later on ported to enterprise by scenster nicknamed Geco in 2011. In this title, the titular knight has to...wait, perhaps the authors will explain better: "There he awoke whilst a shep licked his right cheek and he realised that he hath lost his mighty sword, without which he couldn't continue his journey accross the world. Decided to get accross something, he went accross a lucence-sown field to ask a good farmer if he hath seen his sword. The good fella of incredibly populated frown just pointed in direction of a piece of land full of wild ababol flowers." Hmm...okay...perhaps we`ll just get straight to the gameplay then. 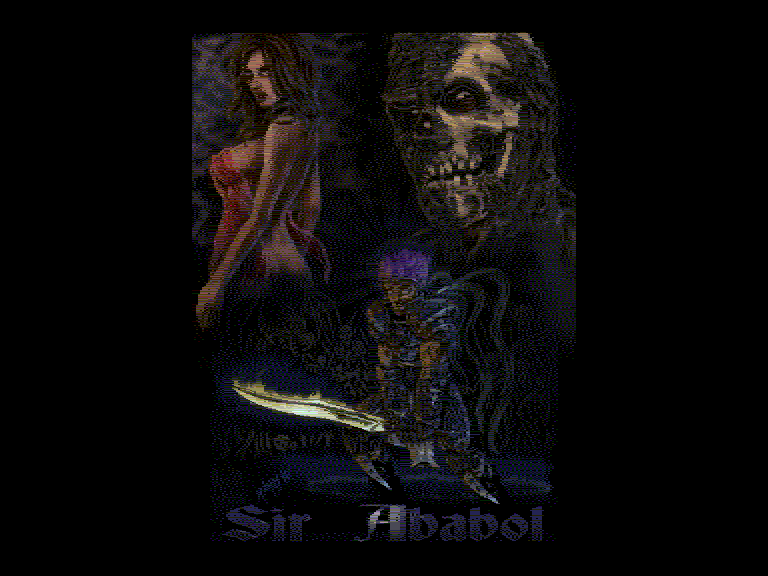 Sir Ababol is a classic platformer - avoid monsters, collect keys, try to find all the ababol flowers. It`s much more forgiving than the ones it styles itself on - collisions drain a bit from your life pool, no insta-deaths here, luckily. Luckily for us, that is, since platformers are not our field of expertise (to put it mildly). In a strange-but-helpful mechanic it is also possible to sometime find a healing consumable (meat?) when going back to a previous screen after being hurt. Jumping itself feels a bit heavy and/or clunky but also somewhat controlled...not too bad overall. Screens are interconnected - allowing for some truly infuriating falls. Gfx = okay, with inevitable Ghosts`n Goblins vibes, music is excellent though. Overall it`s a solid, if uninspired title. Strictly for the fans of 8-bit platformers. 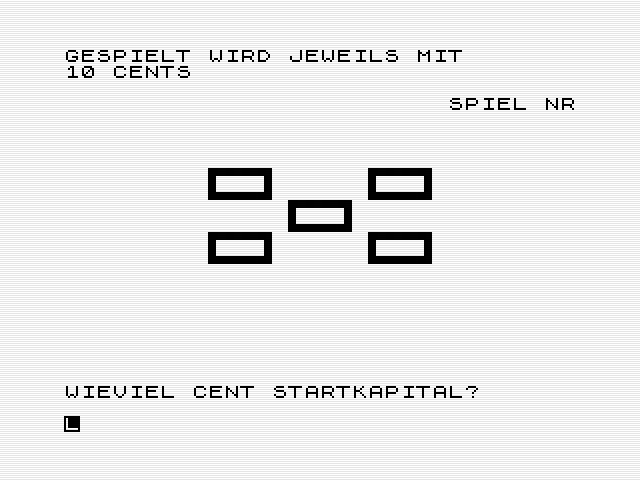 Seems The Random God (aka atmospheric noise) is strictly in an 8-bit mode today - drawing Coin Game for ZX81 as the last game in our current Randomize round. Unfortunately, Coin Game doesn`t seem to live up to it`s name- it`s more of a value generator, for some sort of Real Life play perhaps. 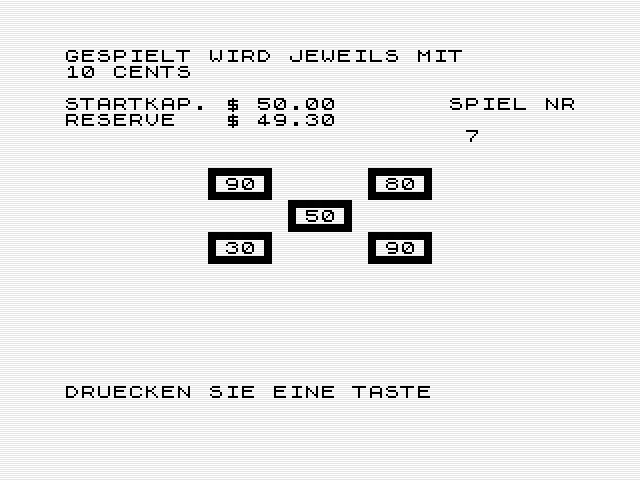 It`s really hard to tell since the game`s in German (though there`s not much text anyway) and all you do is input initial value and then Press Any Key to generate five numbers. This program seems like typical one-function type-in from a magazine ( though maybe we`re wrong and there`s a complex adventure hiding somewhere there). 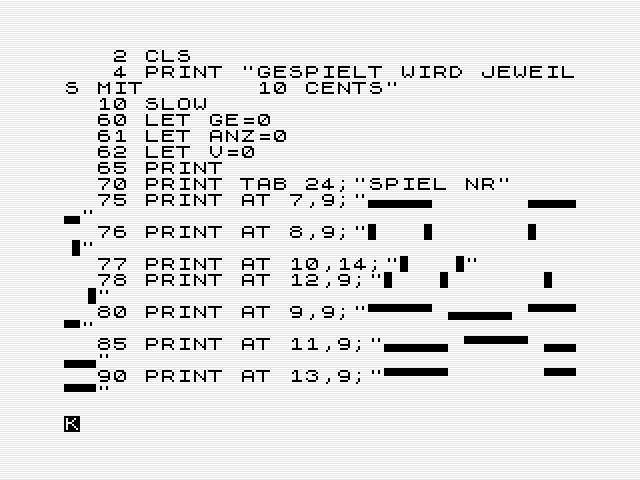 While it`s possible to get into the program`s listing, our rusty BASIC skills didn`t help the investigation much...anybody remembers how to LIST more than the first page on ZX81 by the way? Not much to add here...we`re still kinda curious what does this program do and what game it`s supposed to aid/simulate...for now though it will have to remain one of the Arkham Manor Mysteries. Still, it was a pleasure to see the clean and oh-so-familiar Sinclair BASIC aesthetic - and it`s cute n`crazy non-inline interface.